Designed to be a world-class performer while still retaining past heritage, the fourth-generation Corvette's body, frame, and suspension were all new, with spectacular results. Standing-start acceleration to 60-mph dropped to under seven seconds, top-speeds in excess of 140-mph were seen, and the new brake system stopped the car from 70-mph in 173 feet. Perhaps the greatest achievement was the .90 g-force rating, making the C4 Corvette one of best handling cars in production. In the mid-seventies, GM executives authorized a new Corvette to be built for the 1983 model year, to celebrate its 30th anniversary. A full-scale clay model, based on a sketch by designer Jerry Palmer, was completed by mid-1980. But there would be no 1983 Corvette. After delays and much anticipation, fourth-generation Corvette production began in January of 1983 and were sold as 1984 models. Unlike third generation Corvettes, C4 models did not have separate bodies and frames. Unit construction had the roof, doorjambs, dash, and underbody bonded to a 'bird cage' uni-frame, to which the outer body panels were attached. Fiberglass seams were concealed underneath a rub-strip which extended around the body. This eliminated time-consuming factory finishing, and also tied the front and rear bumpers together visually. A large rear hatch, like the one on 1982 Collector's Edition models, was now standard on all Corvettes. Debuting on the fourth-generation Corvette was a lift-off top panel. This replaced the third-generation's T-tops, which were prone to leaking and rattling. The one-piece top needed no center reinforcement, and was only removable with a special wrench for added theft protection. By mounting the steering linkage further forward, the engine sat lower in the chassis. Designers were then able to use a lower hood line, offering better forward vision and reducing frontal area. The 64-degree windshield angle was the steepest of any American production car at the time. A Lotus-type steel backbone housed the drivetrain, which reduced weight, added rigidity, and allowed more interior space. Routing the exhaust system through a center tunnel gave more ground clearance, more interior room, and less overall height. With superior handling being a major goal, the chassis took a top priority, carefully engineered with weight savings and rigidity in mind. Up front, a transverse fiberglass-composite spring replaced traditional coil springs, and control arms were aluminum. A new five-link rear suspension, using three strut-rods on each side, improved stability and helped isolate noise and vibration. A fiberglass spring was also used in the rear. Four-wheel power disc brakes used aluminum calipers with 11.5" rotors all around. Steering was power-assisted rack and pinion. The fourth-generation Vette was originally intended to ride on wide 16-inch wheels with Pirelli P7 performance tires. The rubber ultimately used in production were Goodyear Eagle VR50's, rated for a maximum speed of over 130 miles per hour. Specifically designed for the new Corvette and sized at P255/50VR-16, the tires evolved from Goodyear's Formula-1 and Indycar rain-tire program. Deep V tread patterns with horizontal slots perpendicular to the sidewalls earned the tires the nickname "Gatorback." The design was said to shed water more effectively to resist hydro-planing, a common problem with wide, low-profile tires. Goodyear Gatorbacks were among the first of the unidirectional tires, in which the radial fins were shaped to direct cooling air to the brakes only when turning forward. Riding on 8.5" cast-alloy wheels in front and 9.5" in the rear, specific left and right wheels were needed, both front and rear, none of which were interchangeable. Opening the long clamshell hood revealed the 350 V8 Crossfire engine, a carryover from the 1982 Corvette. Two throttle-body injectors, one for each bank of cylinders, sat diagonally on a cross-ram intake manifold. The air filter housing, a one-year piece only, featured left and right ducts to pull in cold air. To help save weight, exhaust headers were stainless-steel, and valve covers made from cast-magnesium. Other improvements included an electric cooling fan and serpentine belt accessory drive. Putting out 205 horsepower with 295 lb/ft of torque, engine output was just slightly higher than the 1982 Corvette, but at 250 pounds lighter, better performance was realized. Early 1984 Corvettes were equipped with GM's four-speed 700R automatic, introduced on the 1982 model. Production delays postponed the 4+3 Manual transmission until post-January production. Basically a conventional 4-speed with a second planetary gear-set attached, the Doug Nash-designed 4+3 unit was electronically controlled. When signaled by the engine's Computer Command Control electronics, the auxiliary gear-set engaged through a hydraulic clutch to provide an overdrive reduction in each of the top three gears. This feature could be disengaged with a console-mounted switch. Although designed to improve part-throttle fuel economy, little mileage difference was realized between the 4+3 manual and the 700R automatic. Although gains in headroom and legroom were small, the revised cabin felt roomier, thanks to a 6.5-inch increase in total shoulder room. A tall center console housed the heat/vent/air conditioning and audio-system controls. Standard equipment seats were high-back buckets with reclining back rests. Optional Lear-Siegler seating featured inflatable lumber adjustment and backrest-angle pitch. Full cloth trim came standard, with leather upholstery optional. Cargo capacity was increased and easily accessed by the lift-up hatch window. Standard radio was a Delco AM/FM-stereo, with an AM/FM cassette unit available. The optional GM-Delco/Bose system featured four speakers in custom-tuned enclosures, specifically placed to match the interior's acoustic properties. The space-age instrument panel was met with mixed reaction. An electronic dashboard featured digital read-out displays and illuminated bar-graphs. Gas mileage figures for the 1984 Corvette with the 5.7-litre, automatic 4-speed, was 13 City, 15 Combined, and 20 Highway. 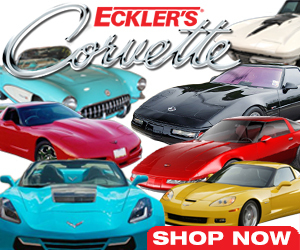 Total 1984 Corvette production for the extended sales year was 51,547 coupes, the second highest in Corvette history.